Flying 41,000km in two months is an incredible feat, but one achieved by Robin May in Namibia at a time when much of the UK was experiencing a waterlogged winter. Read about his trip, which he describes as true indulgence, in the April-May issue of S&G, which also has top tips on how you can achieve goals that motivate and pull you out of your comfort zone. 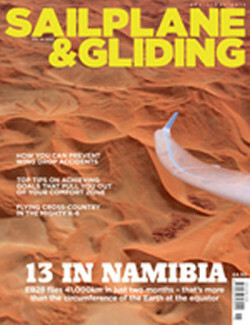 Other essential reading in this issue includes advice on how you can prevent wing drop accidents. Retirement has given Robin May the opportunity to follow his gliding dreams. He took ASH 25 EB28 ‘13’ to Namibia for the winter to indulge in some of the best soaring conditions in the world (352 flights over 1,000km were logged this season). Robin shared the experience with his syndicate members and other gliding friends, logging 51 flights, 330 hours and a distance totalling more than the circumference of the Earth at the equator. Want to turn your own gliding dreams into reality? Find out how you can set – and achieve – goals that will motivate and pull you out of your comfort zone with top tips from Bernard Eckey, author of Advanced Soaring Made Easy. He advises us to focus on a flying skill that could benefit from enhancement, learn from the experts and, above all else, to believe in our ability to succeed. In the concluding part of Jason Hatton’s feature on the mighty K-6, pilots of varying expertise reveal how the cross-country performance of this classic glider has helped them achieve their goals. A look at the BGA Ladder gives an interesting insight into the number of UK cross-country flights in a K-6, with comparable distances being achieved with those by other Club Class gliders. The BGA has recently produced a safe winch launch DVD, developed as part of the ongoing BGA safe winch launch initiative. Since the campaign’s launch in 2006, we have seen a significant reduction in winch launch accidents. However, one type of accident has stubbornly shown no improvement: an inability to keep the wing tips clear of the ground at the start of the launch, resulting in a groundloop, a cartwheel or a combination of both. We were tragically reminded of this as recently as last September, so please take the time to read the Stop the drop feature in this issue. In it, BGA Winching Adviser Andy Holmes outlines the role we all have to play in reducing the number of wing drop accidents. Also in this issue: Pete Stratten offers advice as the process of conversion to the EASA Flight Crew Licensing system begins. Ian Atherton looks at co-operation guidance for operating two-crew in gliders and asks is there safety in numbers? Andrew Mugleston reflects on 40 years of Enterprising competition flights. Mike Bird talks to Hans-Werner Grosse who, at 90, still enjoys flying cross-country in ETA. Graham Garnett reveals how fierce storms and epic retrieves at the Unflapped Worlds in Argentina marked his first comp as manager of Gliding Team GB. Ian Macarthur shares his own memories as a competitor at Argentina. There’s coverage of the 2013 BGA Conference and AGM, including 2012 BGA Trophy winners. Wally Kahn reviews Goodhart: the story of an exceptional man. Development Officer Alison Randle looks at the key indicators for club health. There’s more advice on what to look for if you would like to own a vintage glider. Decide if you would have recognised and avoided hazards during the seemingly innocuous November flight by our anonymous contributor. Plus there are many more of your stunning images in the Gallery pages. Doubling up on the safety factor? Ian Atherton looks at co-operation guidance for operating two-crew in gliders and asks is there safety in numbers? Queen of the skies or SHK? 20/20 hindsight is a great thing, but would you have recognised and avoided the hazards during this seemingly innocuous November flight by our anonymous contributor?